The beautiful sea beach of Nha Trang not only lures visitors for its romantic nature and landscapes, but also for its culinary specialties, including bánh xèo mực (squid pancakes). The food is a pride of Nha Trang since coming into being almost a century ago. It has a place in the heart of locals, and is a must try for visitors, said local food expert Nguyễn Thị Liên, 75. With its delicious flavour, the crispy pancakes, mixed with sweet fresh squid and shrimp, and dipped into a special sauce, are simply unforgettable, she said. Different from its cousin in Sài Gòn, where cooks use a pan which needs a lot of oil; those in Nha Trang pour rice mix into small stainless steel frames placed on an earthenware oven. This makes the cake more tasty and enjoyable, said Liên. 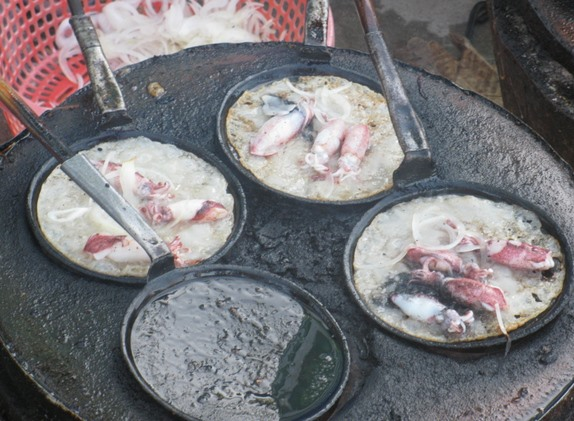 She recalls that her mother made and sold squid pancake to raise her eight-strong family. For nearly 30 years, she woke up very early in the morning to go to the beach and wait for the boats to return from the sea to buy fresh, live squid, the main ingredient of the dish. “My mother’s shop is often crowded from the second lunar month to the eighth lunar month, as this is the season for fresh squid,” said Liên. The ingredients for a four person serving are as follows: 200g rice powder, 250ml water, 100ml beer, 50ml coconut extract, half a spoon of coffee, half a spoon of salt, and half a spoon of saffron powder, mixed with 200g fresh squid, 200g fresh shrimp, onions, cooking oil, green bean sprouts, fennel, rice papers and spice. Liên noted that you must cut off the head and tail of the shrimp, and boil them with the squid. Once they’re done, take them out of the pot and let them dry. 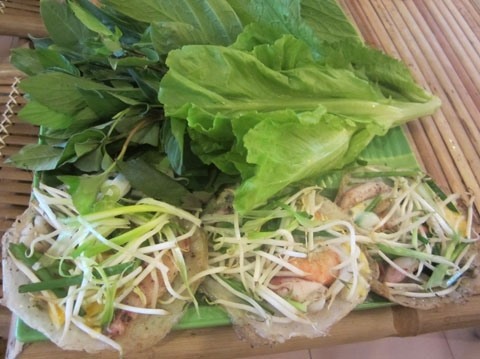 Similar to making other rice pancakes folded in half and filled with a shrimp, meat and green bean spouts, Nha Trang squid pancakes also uses rice powder to make the cover. “Mix it with the saffron powder and salt and pour in water and beer. Stir well until it becomes smooth and then add coconut extract and stir the mix again. The final process is putting onion pieces and a little cooking oil in the mix, and let it sit for 30 minutes before cooking,” said Liên. She said making sauce for the cake is also important as it provides an aromatic flavour. You should choose quality fish sauce and mix it with sugar, lemon juice, and minced garlic and chili. “In the past, my mother often ordered the fish sauce from an acquaintance whose family had been making fish sauce for several generations. Her dipping sauce was highly regarded among diners,” she said. The last process is frying the pancake. First you should apply a little cooking oil, and then pour a spoonful of mixed rice powder. Next you add the shrimp, squid and green bean sprouts to the thin paper. After several minutes the cake turn yellow and an aromatic fragrance can be smelt," said Liên. Dung said the dish was her favourite during her one week trip to Nha Trang. She has tried several shops serving it, including Huỳnh Thị Bảy on the corner of Lê Thành Phương- Trần Quy Cáp Streets or on 52 Phan Bội Châu Street. Herbalist Nguyễn Văn Tuất, from the National Hospital of Traditional Medicines, said the dish is good for cooling down the body, and is also very nutritious, making it ideal for sick patients. Local delicacy: Making bánh xèo mực, Nha Trang style. Delicious: A plate of tasty and delicious bánh xèo mực will make your mouth water. 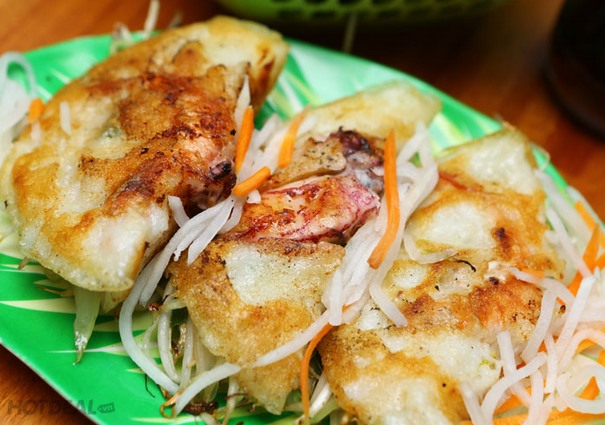 In demand: Nha Trang squid pancakes lure a lot of visitors from inside and outside the country.